It is under the guidance of Chökyi Nyima Rinpoche, Founding President of Rangjung Yeshe Shenpen that we started this important reconstruction project new months ago. The project consists to sponsor the purchase of the construction material for the 55 houses that will count the new village of Tallo-Aale, Dhola-7 in the district of Dhading. The community members are all involved in the construction of their future village. With an engineer living on the site, they are currently building their own earthquake resistant homes. In the same time, they are building their knowledge and skills. Some of them wish to use this new knowledge and start a small construction business for the profit of the entire community and the other victims of the earthquakes. Before the devastating earthquakes of April 25 and May 12, this community was living in a remote village called Lapa (means hidden place in Tamang) close by the Tibetan border in the district of Dhading. To reach the village, they had to walk two days from the closest road. The ground shaking changed their lives forever. Some lost their a relative and most of them their houses. Staying there was impossible: how to rebuild in such a remote area? And why since it is at high risk of landslides? With the help of different organizations, the leader of the community, Dinesh Tamang, organized the relocation of the community. Therefore, the community had to leave behind a big part of their life and history and walk towards a new life. While looking for help and sponsors, the community took the decision to make as much as they could even not have funds or resources. As they have experimented carpenters, they started building all the door and window frames they would need for the fifty-five houses. During that time, they also start digging the numerous eight-foot holes they would need in order to build earthquake-proof houses meeting the standard of the National Reconstruction Authority. At that time, Dinesh and everyone in the community was already thinking and planning for the future of the village. All the children of age to go to the primary and secondary school have been admitted to the local school around. Everyone has to attempt and all the children are happy to go to school. A kindergarten has been created in a UNICEF tent. During the time the toddlers are going to the daycare, parents can work on the future houses. In that community where the smaller resident is only 2 months old and the eldest one 98 years old, everyone is looking to each other, trying to help as much as they can. In September, we met with the leader of the community, Dinesh Tamang, how came to Ka-Nying Shedrub Ling (KNSL) in order to get advice on how to build the first two concrete structures of the community: stupas! Representatives of Rangjung Yeshe Shenpen and monks of KNSL were impressed by the commitment and willingness of all the 310 members of the resettled community. Even if they didn’t have any money to start the construction of the houses, they started work with whatever they had: natural resources, some knowledge and a lot of willingness. They started digging the eight feet deep holes needed in order to make solid foundations and under the supervision of the two carpenters of the community, they built all the frames for the doors and windows of their eventual houses. Chökyi Nyima Rinpoche came to know about this project that perfectly fitted with his vision of Shenpen’s involvement in post-earthquake work. For Rinpoche, Shenpen had to move from relief to reconstruction work and had to choose a project and get 100% involve in it. This project was perfect for us! After visiting the site, meeting with different members of the community, evaluating the financial and material cost of such a project, the whole family of KNSL decided to jump into the adventure trying to give the gift of opportunity to a devastated community. 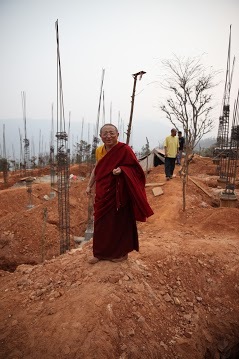 From then and under the guidance of Chökyi Nyima Rinpoche, Rangjung Yeshe Shenpen sponsors the construction of 55 houses for 55 amazingly resilient families. But in order to build these houses promptly and solidly, we are asking for all of you to help them by sponsoring a house or a part of a house, by volunteering, or sharing with us your knowledge or your network. In joy and sorrow all are equal. Be the guard of all, as of yourself. since pain it is, just like my own. for they are living beings, just like me.